I have decided to start getting creative in the kitchen with salad dressing recipes. I made cucumber and feta salads during the summer months to go with what we were cooking on the barbecue. I would ordinarily serve this with my standard salad dressing which I always have in the fridge, and elevate the flavours with a bit of fresh mint, straight from the garden. However, in my attempt to change things up a bit with new salad dressings, I decided to make one using yoghurt and tahini. Tahini is another ingredient I always have in my pantry as I much prefer to make my own hummus than buy it. This salad dressing is quite versatile and it will work perfectly on some boiled potatoes as well. Maureen – imagine some toast with a smear of this and some good pumpkin and split pea soup. Delish! Yum. This dressing sounds amazing!! I love tahini. 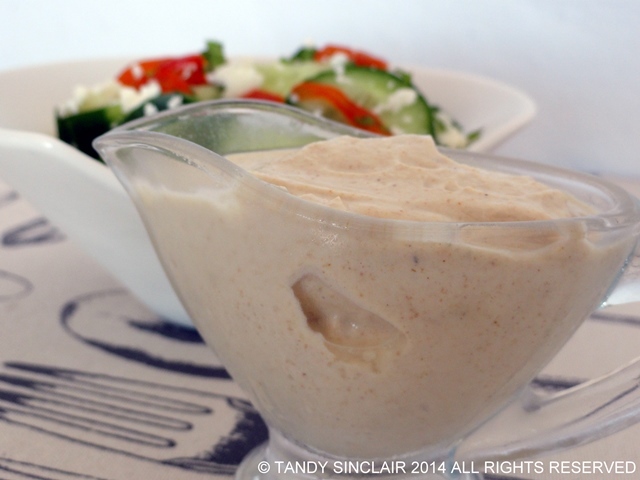 Tahini in salad dressing always sounds good to me! Love this! I LIKE this salad dressing. In winter I go for soup and in the summer I can’t stay away from salads. I think I could take this dressing for a test drive even in the winter. It sounds lovely – I love tahini and cumin. Hi Tandy, love this combination, bet this would also be great on a sandwich. The cold weather the past few days has had my mind far away from salads and dressings. Hope it doesn’t last long. Yum,Yum,yummmmmm,…What a fab tasty dressing recipe! The dressing shows off a lovely colour! I think it will be good for chicken breasts, too! Yum! Yeah, I’m very low key when it comes to dressings. This one though, I would love to try… tahini… so good.